The first card is the Prince of Pentacles which suggests one of you was either tired of the relationship being very repetitive and boring. This may have been part of the reason why it didn’t work out, maybe someone lost interest in the other or was bored that the same thing happens day after day with no excitement? 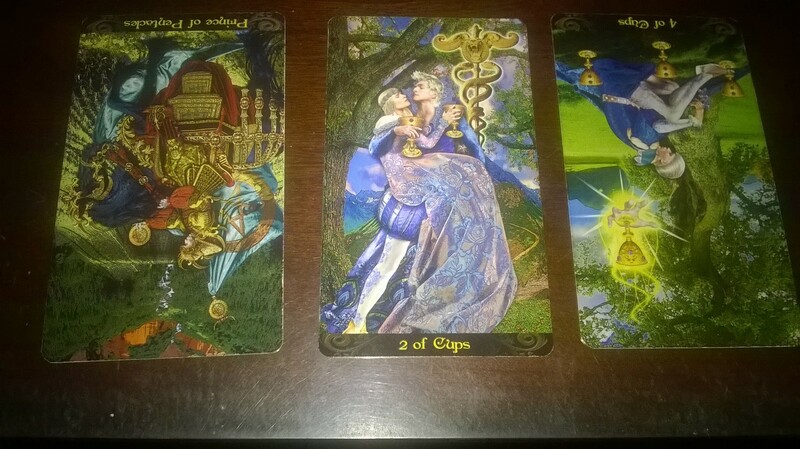 The second card is the Two of Cups and I’m not sure what is the reason you had separated? Could it be something you had done to make them upset about something? I do see you will or should try again. They may have been upset about something. Whatever it is, would be good to smooth things over, open the lines of communication, because there is potential for a connection again. Maybe arguments had to be made in order to understand each other better? But I do see you reuniting again, maybe they need some time. The last card is the Four of Cups (reversed) and looks like there will be an opportunity again to reunite, but you will need to work hard at it. I don’t know if there was a trust issue, but there is a block that maybe needs to be proven to them that things changed? Also both of you will need to open your hearts if you are not the type to express your feelings and what you want in the friendship/relationship. You can both move on from the past, but learn from it as well. I feel maybe they are still holding a grudge about something, but possibly misses you. Have courage to say what you feel and be patient and go slowly. Work at making a friendship again. There is potential there.